For special products, some multipliers may be applied to Perkies earned, e.g. 1,25 (125%) or 1,5 (150%). The products concerned and related multipliers, if any, will be announced on the Perks & More program website. For example: if the participant has not yet earned their first 500 Perkies, for every €100 spent at distribution, the participant will earn 1,5 Perkies (instead of 1 Perkie) if the 150% multiplier applies. For the Built-to-Order (BTO) products only the base unit will be considered for Perkies. Only by equipping our Client Computing Devices with the latest Intel® Core™ processors across the range can we deliver the performance and reliability necessary to meet the demands of the modern workplace and mobile professional. 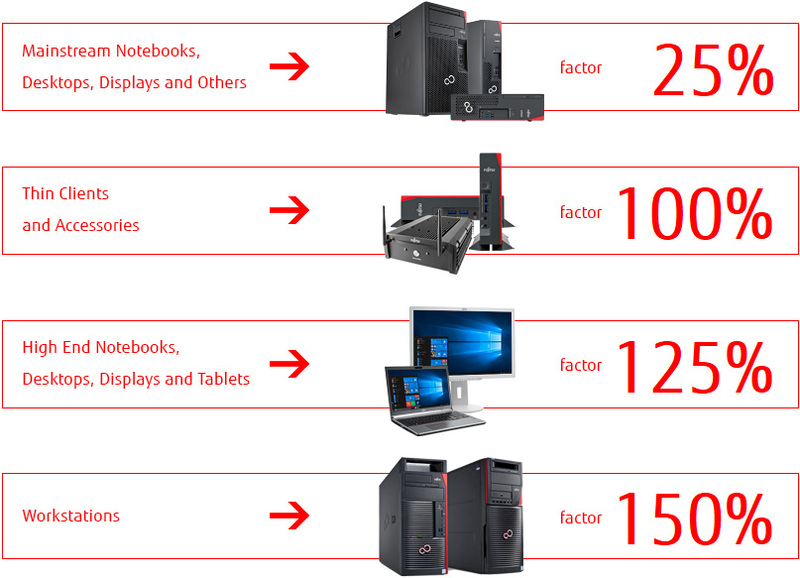 Fujitsu Client Computing Devices employ the latest Intel 7th generation Intel® Core™ processor family and Intel® Xeon® CPU chipsets in devices ranging from ultra-mobile LIFEBOOK notebooks to CELSIUS Rack Servers to deliver the top-level performance that businesses need. Integrated Intel HD Graphics support, from Intel HD to Intel UHD Graphics provides the graphical processing power behind devices from STYLISTIC Tablets to ESPRIMO Desktop solutions.